Cold summer soup deserves to be a common thing in our menus. The bowl of it is a real saviour in a hot summer day. It is cooling and refreshing, yet nourishing at the same time. Besides, it works like a good bottle brush for an intestine, making you feel as if you lost several pounds overnight. There is a great variety of cold soups in traditional Eastern European cuisine. But all of them have one common idea – you prepare dry ingredients (“salad”) and a liquid base separately, refrigerate them separately and mix dry and liquid parts right in a serving bowl. 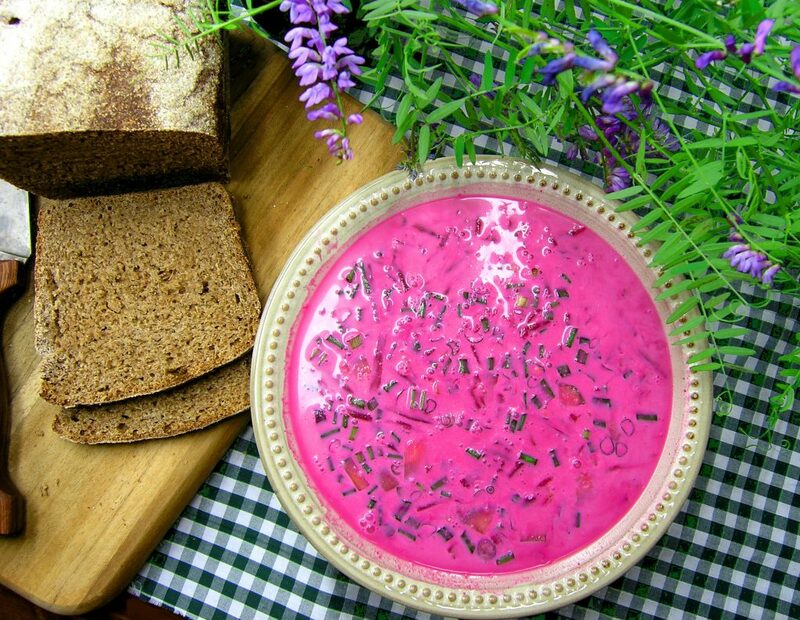 Let me start with one of the ways to prepare my favourite one – Cold Beet Soup. Brush and wash (do not peel) beets, place them in a pot. Fill the pot with 3 litres of cold water, add 2 table spoons of white vinegar and let the beets boil over low heat for about an hour or until cooked through. Remove the pot from the heat and let it cool down ( I usually place it in a sink with cold water if I don’t have time or patience to wait). When cool enough, take the beets out, peel and grate them. Strain the liquid slowly as there might be a little bit of dirt from beet skin on the bottom, may be even discard the last few drops. Put the grated beets back into the liquid, add apple cider vinegar, salt and sugar, mix well and send the pot to a refrigerator to cool completely. 2 Lb potatoes, boiled in skin and cooled down. Peel and grate cold boiled potatoes. Chop eggs coarsely, scallions and dill finely, dice cucumbers (if you find the skin is tough, peel it off). Combine potatoes, eggs, cucumbers, scallions and dill, add a bit of salt to taste. There may be a lot of variations of “salad”, you don’t have to stick to the recipe! You may add grated radishes in season or you may add diced ham to it! When serving, place a few table spoons of “salad” in a soup bowl and pour liquid part on top (stir it well first to distribute grated beet evenly). Garnish your Cold Beet Soup generously with sour cream.